Future teachers can have theoretical informations connected with practical approach by observing teaching for Foundation group in practice and as well new teachers can paint as well during lectures. If you have completed any of the levels and just want to join us to paint you will pay only half of the course fee. Course will be taught in English with Polish translation for any non-English speakers. 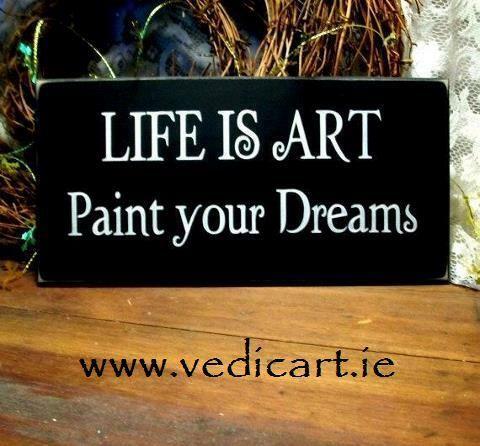 Vedic Art is an intuitive painting method, that allows you to connect with your heart and let your inner world manifest on an empty canvas. You don’t need any previous experience or artistic ability to benefit – the process of connecting with your creativity is stimulated by 17 spiritual principles that work on a deep subconscious level and let your inner artist come out to create art and your life! The 17 principles come from the ancient Indian teachings, the Vedas. The ancient Vedic scribes from India tell us that just as a seed knows it will become a flower so too, we have within all knowledge of ourselves and life itself within us. The principles are guides both in art and in life; they teach us a science of life and natural laws which exist in all of us but are not yet activated. Taking part in a Vedic Art course is a wonderful way for you to connect with your creativity, reduce stress and liberate the potential for new ideas. * Your heart in result opens up to show the truth about yourself and your own divine presence. Painting materials not included in the price: canvas, acrylic paints and brushes – they can be bought at the course (bargain prices) or students can bring their own. Other materials will be provided.